This book offers scholars and students of Hellenistic and Roman literature an overview of Hellenistic epigram, a field closely related to other Hellenistic poetry and highly influential upon Roman poetry. 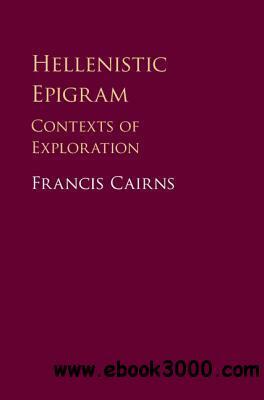 In fourteen themed chapters, it foregrounds the literary, linguistic, historical, epigraphic, social, political, ethnic, cultic, onomastic, local, topographical and patronage contexts within which Hellenistic epigrams were composed. Many epigrams are analysed in detail and new interpretations of them proposed. Throughout, the question is asked whether epigrams are literary jeux d'esprit (as is often assumed without proper discussion) or whether they relate to real people and real events and have a function in the real world. That function may be epigraphic, for example an epigram can be the epitymbion for inscription at someone's grave, or the anathematikon for inscription on or beside a dedicated object, or a picture-label - an ekphrasis to accompany a painting or mosaic.